Camping Le Pontet offers a delightful setting to enjoy the outdoors with all the comforts you need. This beautiful luxury camping site sits on the banks of the L’Isle river, making this the perfect spot for nature lovers. 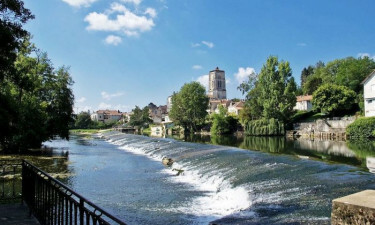 Situated in Saint Astier, Camping Le Pontet offers luxury camping only 500 metres from the heart of the town. The large holiday camping site is in Dordogne-Périgord, a picturesque region of south-west France. This makes Le Pontet an ideal spot for exploring the cultural and natural wonders of the region. Why Choose Camping Le Pontet? Whether you are staying in a mobile home or a tent, Camping Le Pontet has spacious pitches and comfortable accommodation. The five-hectare riverside campground is a lush and idyllic environment with modern amenities, including swimming pools and leisure facilities. If you are planning a luxury camping holiday to Le Pontet, book with LuxCamp. This leafy campground boasts a beautiful swimming pool to cool down and relax. For little campers, there is a shallow wading pool. There is also a large waterslide for thrill seekers. The river is a peaceful location for swimming and fishing. 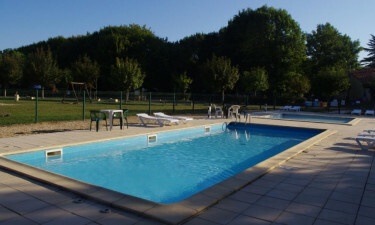 For a fee, you can also visit the nearby indoor swimming pool in Saint Astier. A children’s playground keeps younger visitors entertained. There are also fantastic sports facilities, including tennis courts, a beach volleyball court and mini-golf. An on-site restaurant and bar has a delicious menu for meals and snacks that you can also have as a takeaway.